The Eastern League has named Michael Taylor the Player of the Month for May. In 29 games in May, Taylor hit .374 (40-for-107) with nine home runs, 22 RBI, 23 runs scored, a .446 on-base percentage and a .720 slugging percentage. All of these marks set new monthly highs for the centerfielder in his career. During the month, he finished among the top five Eastern League players in eight offensive categories and was first in slugging percentage and OPS. The 23 year-old registered a hit in 23 of the 29 games he appeared in and finished the month with 13 multiple hit games. 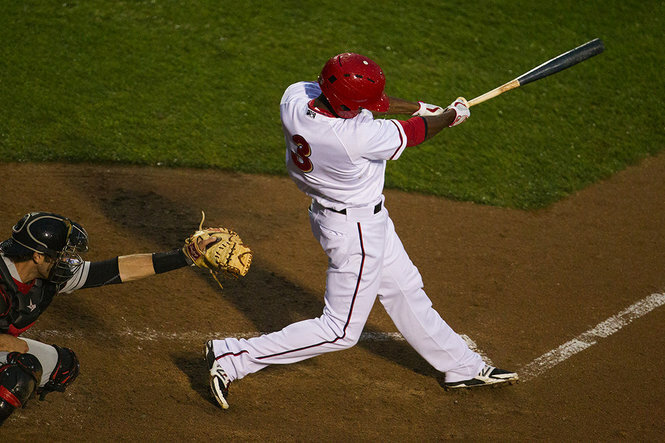 Taylor entered the 2014 season as the seventh ranked prospect in the Nationals organization by Baseball America. The Fort Lauderdale, Florida product was drafted by the Nationals in the sixth round of the June 2009 Draft. Taylor is the first Senator to win the award since Stephen Strasburg was named the Eastern League Player of the Month for April 2010. This entry was posted in Uncategorized and tagged Eastern League, Harrisburg Senators, Michael Taylor. Bookmark the permalink.